Travis has been professionally teaching and guiding a wide variety of outdoor skills for over 10 years. 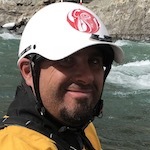 He has led a number of river expeditions across Northern Canada, he is a certified paddling instructor, avalanche safety instructor, ski/snowboard instructor and instructor for the Canadian Safety Council. He is a Raven Medical instructor, and an instructor trainer for Raven Rescue’s swiftwater, jetboat, and ice programs. Travis is a dynamic and experienced instructor and we are proud to have him as part of our team.